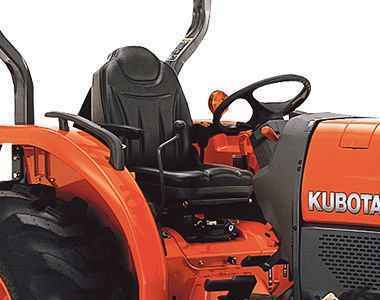 The Kubota L3540HDA tractor is best suited to the operator looking for a mid-sized tractor that offers premium performance, versatility and comfort. Powered by Kubota’s 35HP, 3 cylinder diesel engine and HST Plus transmission, the L3540HDA delivers high performance and professional results for tasks both small and large. Expect top of the line features, including Intelli-Panel, Kubota’s unique tractor monitoring system and luxury reclining seating for ease of operation and comfort during those long hours of operation. Available with a number of attachments, you will come to rely on the L3540HDA, boosting your versatility, efficiency and productivity. HST Plus’s automated control of both the HST pump and drive motor gives you optimal performance, regardless of the task, working conditions or operator expertise. Featuring three speed ranges, the L3540 includes a steering column lever to shift between high and low speeds for each range, expanding your options to six total speeds. Once your preferred range shift speed is set, you can easily shift the H-DS between the high and low speeds while moving. With a simple touch of the mode selection button you can activate the auto H-DS for automatic Hi/Lo shifting. Deluxe high back seat provides soft arm rests, wide seating, firm, shock-absorbing springs, a retractable seat belt and a weight-sensitive design that adjusts to your own posture. Seat swivels 12 degrees in each direction to better assist the operator when using rear implements. The Grand L40’s fender and wide step deck features a larger, more comfortable step-through area. The versatile 72” mower features right-side discharge, adjustable cutting heights in 0.5” increments and is compatible with the front loader. BH77 Backhoe is performance-matched with the L3540 to deliver more power and greater capacity. With a full-flat deck, the backhoe delivers optimal legroom for maximum operator comfort. New curved boom offers greater digging capacity as well as easier operation and better visibility. All hoses are tucked away in the backhoe arm for enhanced protection and a streamlined design. 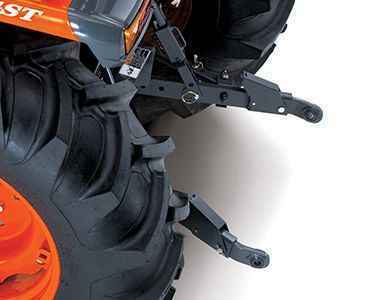 Kubota offers an optional Mid-PTO for L3540HDA that can be used with a variety of mid-mount attachments. 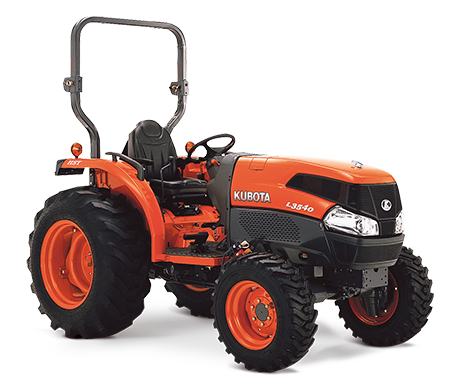 Designed to match the performance of the Grand L40 Series, Kubota LA714 front loaders ensure precise operation and improved productivity. This convenient system saves valuable time by letting you attach and detach the loader from the tractor. The mounting pins and hose couplers can be removed from the operator’s seat, without tools.